There is always a risk in remaking an older film, especially if that film is a classic and starred the likes of Amitabh Bachchan, Jaya Bhaduri, Pran, Om Prakash and Ajit Khan, to name but a few. So bearing that in mind, there were a couple of approaches I thought the makers of Zanjeer might take. However rather than keeping the same storyline and characters but updating the film to the present day, or using the original film as ‘inspiration’, Suresh Nair and Apoorva Lakhia seem to have gone instead for a middle of the road approach, keeping a few key scenes and characters but otherwise changing plot points rather randomly. The confusion in the story is not helped by reducing both the heroine Mala (Priyanka Chopra) and the villain Teja (Prakash Raj) to comic relief, while as the hero, Charan ends up as much less of an angry young man, and more of a petulant and plain bad-tempered one. Even worse, director Apoorva Lakhia doesn’t let Charan dance – except for a few basic steps with Sanjay Dutt – until the song over the end credits. Even then the choreography is particularly uninspiring. However, despite the dog’s breakfast of a story and enough plot holes to swallow the entire cast of thousands, there are a few reasons to watch this film, although I’d recommend waiting for the DVD and the FF button. The film starts with a particularly sleazy and unattractive opening song where a scantily clad but heavily begrimed female dancer twists and turns her way through numerous hanging chains in a very S & M inspired look. Thankfully that’s probably the absolute low point of the film, and there’s really no other option than for it to improve from here – it couldn’t possibly get any worse. The visuals then switch to a shirtless Charan twisting in bed in the throes of a nightmare, followed by some blatant muscle flexing and posturing, and it’s immediately apparent that subtlety is not a word in Apoorva Lakhia’s vocabulary. Not that I’m complaining about some blatant over-exposure, but it’s a bit too obvious and cheap for someone who is already an established star with a couple of hit films under their belt. As if that wasn’t enough, Charan’s opening action scene as ACP Vijay Khanna takes place under the protective gaze of his father Chiranjeevi, and his uncle Pawan Kaylan, as they beam down from posters in the background. As I said, subtlety is definitely not on the agenda for Zanjeer. 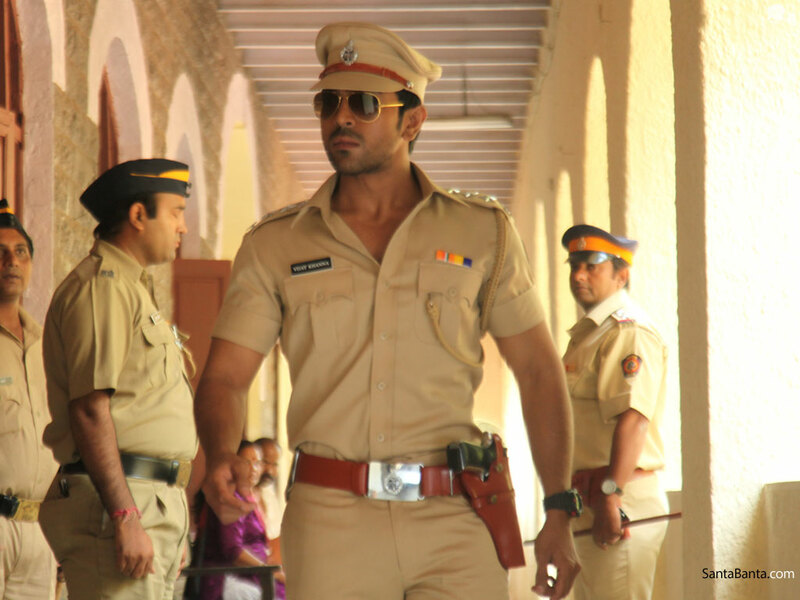 After his latest contretemps, ACP Vijay Khanna (Charan) is transferred for the umpteenth time for his enthusiasm in subduing the local riff-raff, but this time is moved all the way from Hyderabad to Mumbai, presumably in his superior’s hope that he won’t be able to find his way back. Meanwhile, Mala, a ditzy and dumb NRI is visiting her FB friend to attend her wedding, this clumsy piece of scriptwriting thus ensuring that Mala knows nothing about India, or Mumbai and in addition knows no-one in the area once her friend heads off on her honeymoon. By careful and contrived manipulation of events, Mala witnesses a murder, and does at least report it, but from there her character is increasingly less convincing as a modern woman, as she tries to avoid any further involvement with the police or the case. Sadly, rather than the feisty knife-wielding Mala of the original, this Mala is an overly chirpy drama queen who seems quite oblivious to the cultural differences between Mumbai and New York. Priyanka is giggly and immature but still looks older than her co-star even though there isn’t much difference in their respective ages. 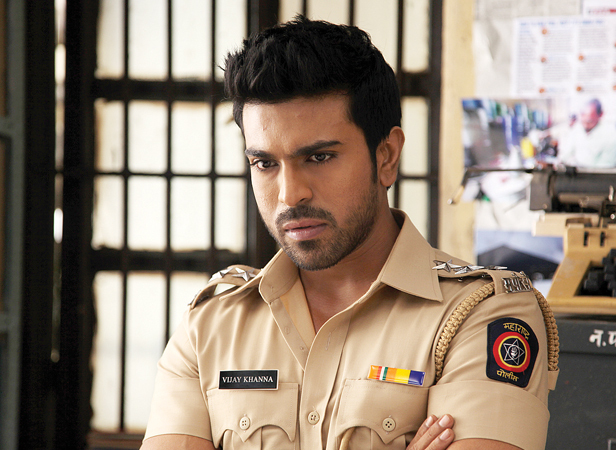 This may be down to Charan’s youthful good looks, but is more likely due to some heavy make-up for Priyanka. There is also zero chemistry between the two, and their romance doesn’t so much develop as suddenly materialise in the space of a few glances and a song. The storyline seems to have called for a romance between the two which had to start by a certain point in the film, and so it did. No build-up, no justification, just ‘let there be a relationship between Mala and Vijay’, and boom there it was! The murder witnessed by Mala leads to exposure of the illegal petrol trade, helped by the revelations of one of the new characters, journalist Jaydev (Atul Kulkarni). Atul Kulkarni puts in a good performance as the investigative journalist, and revels in a more sensibly drawn character with a defined storyline – something of a rarity here. Sanjay Dutt as Sher Khan keeps to the original character as played by Pran, and his world-weary look actually suits the part. However his every appearance is heralded by incredibly loud and intrusive background music which completely overshadows his performance. Keeping the character of Sher Khan similar to the original also backfires since the simple ‘crook with a heart of gold’ just doesn’t fit with the other modernised characters, although the scenes between Sher Khan and ACP Vijay are still some of the best in the film. Or would have been if they’d just stopped with all the loud background music! Prakash Raj’s Teja is a bumbling buffoon in an ever more outrageous array of colourful suits and patterned cravats. In fact one of the high points of the film is waiting to see just how garish and inappropriate his next outfit will be. But turning the unscrupulous and immoral Teja into comic relief just doesn’t work, and Mona Darling’s (Mahie Gill) best efforts with Viagra and other seductive devices fall flat too. Prakash Raj is, at least initially, suitably oily and effusive, but the dialogue (going by the subtitles) is clichéd and too ridiculous to hold any menace or threat. However it’s not all completely terrible. What does work well in the film are the action sequences, and there are plenty of them. Charan is effortlessly effective in the fight scenes and his energy lifts the film, particularly since he tends to keep a glum and glowering expression in most of the scenes with dialogue. There are plenty of the required explosions, chase sequences (through Ganesh Chaturthi imersion celebrations of course) and mass fight scenes. Charan also did well with the angry glare and volcanic temper of Vijay, but the reasons for his rage are never very well explained despite that being the whole point of the original film. Worth a DVD watch for Charan and Atul Kulkarni, and to play your own version of ‘spot the worst Prakash Raj outfit’! This entry was posted in Bollywood and tagged Apoorva Lakhia, Atul Kulkarni, Charan, Hindi, Mahie Gill, Prakash Raj, Priyanka Chopra, Ram Charan, Sanjay Dutt, Suresh Nair, Zanjeer. Bookmark the permalink.